Days after viewing writer/director Ana Lily Amirpour’s The Bad Batch, I’m still contemplating what I just saw. That can be the sign of a good, thought-provoking movie, or it could be further proof that The Bad Batch is really an empty experience. In a not-too-distant future, the United States has found a unique solution to crime. Those deemed irredeemable are tattooed with “bad batch” and abandoned into the American Southwest. It’s a dusty land of outlaws that the U.S. doesn’t even recognize. Arlen (Suki Waterhouse) is deposited into the wastes of the Southwest and she is abducted by cannibals who make a meal out of her right arm and leg. She escapes and finds Comfort, a small outpost where she can heal and find community. The makeshift leader of Comfort is The Dream (Keanu Reeves), a messianic figure who doles out free drugs to the townspeople. He also has a harem of pregnant women. 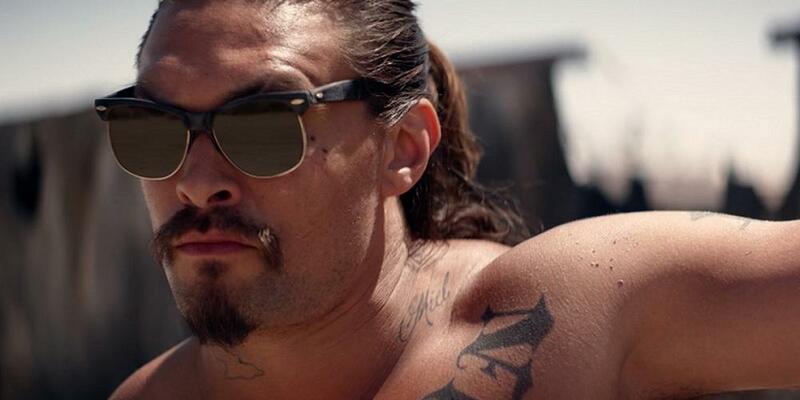 Miami Man (Jason Momoa), one of the hunkier cannibals, loses his daughter and forces Arlen to help him. I’m going to summarize the sparse two-hour plot, dear reader, to share with you just how little there is to this film (will keep spoilers mild). Arlen gets kidnapped. She escapes. Months later she kills one of the cannibals. She quasi-adopts a little girl. Her father goes searching for her. Arlen loses the little girl. The father finds Arlen. They find the little girl who was unharmed. They eat a bunny. The end. Now admittedly any movie can sound rather flimsy when boiled down to its essential story elements (Star Wars: “Space farmer accepts call to adventure. Rescues princess.”) but the counterbalance is substance. Characters, world building, arcs, plot structure, setups and payoffs, all of it opens up the film’s story beats into a larger and transformative work. That’s simply not there with The Bad Batch. It’s a vapid film that has too much free time to fill, so you get several shots that are simply people riding motorcycles up to the camera. I grew restless waiting for something of merit to happen. Arlen simply just walks out into the desert like three different times, and this is after she was captured by roving cannibals that are still out there in healthy numbers. If you went to a store and the owner captured you and cut off your arm, would you venture back in that direction? Maybe there’s a commentary about victimhood and the cycle of abuse and exploitation, or maybe I’m left to intuit some kind of grander implication out of a filmmaker’s lack of effort. There’s just not enough here to justify its running time. It feels stretched beyond the breaking point. If the film is meant to be about immersion, something that holds together via hypnotic Lynchian dream logic, then it better work hard to hold my attention since plot has already been abandoned. This is where The Bad Batch also lost me. It’s just not weird enough, though even weird-for-weird’s-sake can be insufferable, like Harmony Korine’s Gummo. Amirpour (A Girl Walks Home at Night) has an innate feel for visual arrangements and little quirky touches that can burn into your memory, like the sight of Arlen sidling next to a magazine clipping of a model’s arm she taped to a mirror or a well-armed pregnant militia. The most interesting elements of the story are left unattended though. This is a vague dystopia where the government has decided to let the “bad batch” fend for themselves in a desert. It screams neo-Western with a lawless land populated with criminals and killers. There are only ever two locations we visit: the cannibal’s junkyard and the outpost of Comfort. Do we know anything about these locations? Are they at war? Is there some kind of understanding between them wherein Comfort offers sacrifices for protection? Is there an uneasy peace that could be spoiled thanks to Arlen’s vengeance? It’s all just vast wasteland, but even when they get to actual places, it still feels like empty space. How can you make something about dystopian cannibals be this singularly boring? The characters just aren’t worth your attention and ultimately don’t matter in service of story or even a potential message. Arlen is much more of a figurehead than a person, and perhaps that’s why the director chose Waterhouse (Pride and Prejudice and Zombies) as her lead. The former model certainly makes a visually striking figure and knows how to arc her body in non-verbal ways to communicate feelings. However, I don’t know if there’s a good actress here. There’s no real reason to take away her arm and leg except that it looks cool and edgy. Initially it presents a visceral vulnerability for her and a disadvantage of escape, but after she arrives in Comfort, it’s as if she’s just any other able-bodied character. It feels like the director just liked the look and thought it would grab attention or say something meaningful. Momoa (Justice League) has a natural intimidating screen presence but he’s given so little to do. He’s just on glower autopilot. Miami Man is a killer and we watch him cook people’s limbs for some good eats. It’s almost like the movie wants you to forget this stuff when his paternal instincts kick in. Rather than embracing the light-and-dark contradictions, the movie just has him shift personality modes. There’s no confrontation or introspection. Reeves (John Wick 2) gets an idea of a potentially menacing character but even he isn’t presented as an antagonist. The Dream is living large thanks to the cooperation of those in Comfort. He has a harem of willing ladies for breeding but he doesn’t seem dastardly. He’s like the grown-up rich kid throwing the party that everyone attends. Then there are near cameos by Giovanni Ribisi, Jim Carrey, and Diego Luna, which make you wonder why they ever showed up. 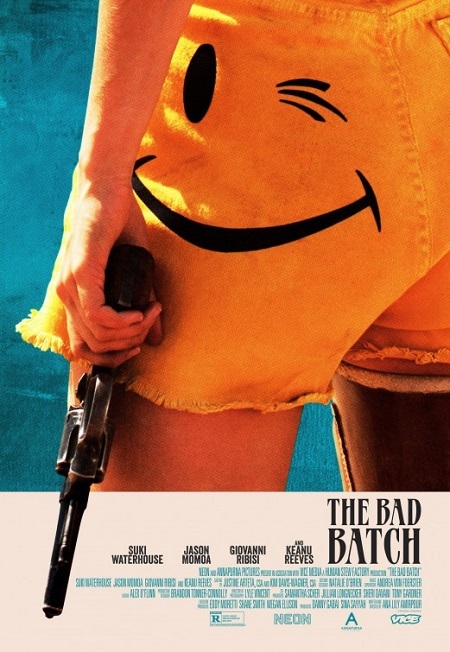 The depressing part is that The Bad Batch starts off with a bang and had such potential. Amirpour is so assured early on and draws out the terror of Arlen’s plight in a gripping and satisfying manner. Her drifting is then met by a futile escape, and then we witness the relatively tasteful dismembering of our heroine. It’s disorienting but establishes the conflicts of the scene in a clear and concise fashion. The odds are against her and Arlen uses her captors underestimating her to supreme advantage. The opening twenty minutes are thrilling and well developed, presenting a capable protagonist and a dire threat. And then the movie just drops off the face of the Earth. I haven’t seen a movie self-sabotage an interesting start like this since perhaps Danny Boyle’s Sunshine. The first twenty minutes offer the audience a vantage point and set of goals. We’re learning about Arlen through her desperate and clever acts of survival. The rest of the movie is just bland wandering without any sense or urgency or purpose exhibited in that marvelous opening (hey, the amputated limbs special effects look nice). Vacuous and increasingly monotonous, The Bad Batch valiantly tries to create an arty mood piece where it re-purposes genre pastiche into some kind of statement on the broken human condition. Or something. The story is so thinly written and the characters are too blank to register. They’re archetypes at best, walking accessories, pristine action figures given life and camera direction. It’s flash and surface-level quirks with distressed art direction. It feels like it’s trying so hard to be a cult movie at every turn. I’m certain that, not counting Keanu’s cult leader, there might only be 100 words spoken in the entire film. I feel like The Bad Batch is going to be a favorite for plenty of young teenagers that respond to its style and general sense of rebellion. Until, that is, they discover movies can have both style and substance.